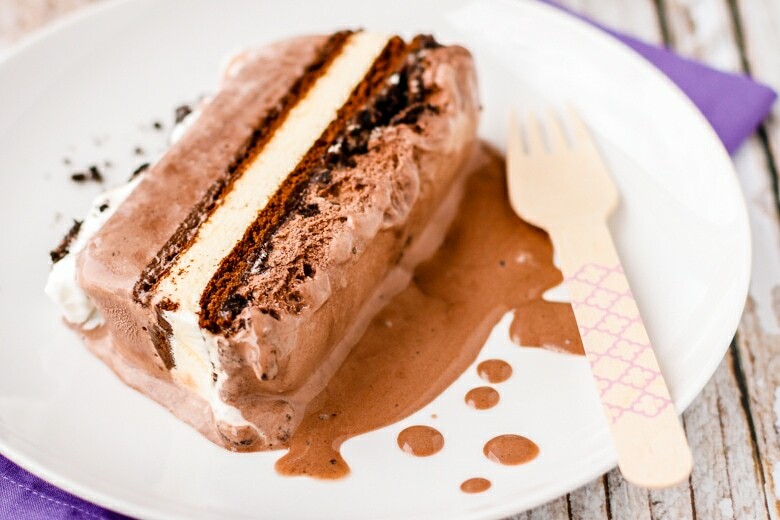 If you need a dessert that will wow the crowd in a hurry, look no further than this easy ice cream cake recipe… Prepare it in just 5 minutes (plus freezing time)! Once upon a time, my husband decided he’d like to host a “small” 4th of July cookout… You’d think I would have learned by now that my husband never does anything small. So I really shouldn’t have been surprised when, what started as a guest list of about 25 friends and family, quickly spiraled to upwards of 50 people. To say I was feeling a tad stressed out is an understatement. Luckily he asked everyone to bring a side or dessert, but we’d already made two additional trips to Walmart for more meat, utensils, napkins, trash bags, etc… Being a firm believer that you can just never have too many desserts, I also asked him to grab the ingredients for my favorite ice cream cake recipe on his last (and I hoped final) trip. The good news is this is seriously the easiest ice cream cake recipe ever! It requires no baking, and you can totally customize it however you prefer. 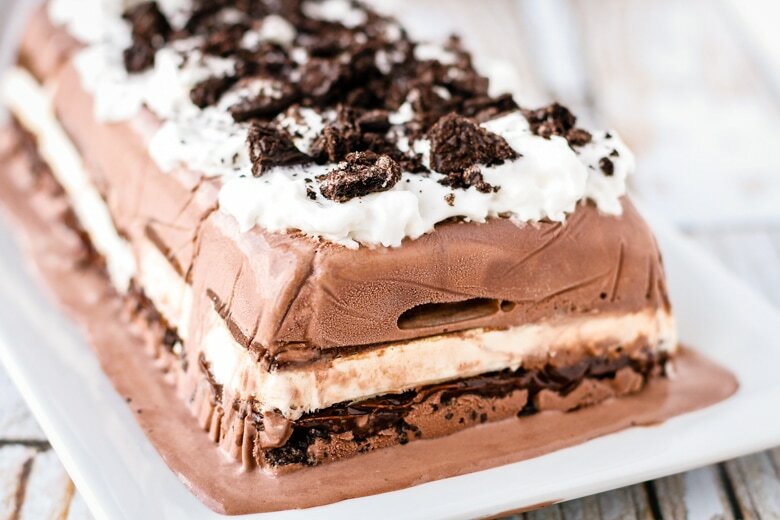 I chose to make an Oreo ice cream cake with chocolate ice cream, coupled with vanilla ice cream sandwiches, crushed Oreo cookies, and a thin layer of Smucker’s hot fudge. Dare I say it might even be better than a Dairy Queen ice cream cake?! Normally I’d make my own homemade whipped cream, but since I was in a pinch for time, I asked him to grab a can of Reddi-wip. He brought home a can of their extra creamy variety to top it off. Can I just say this stuff is like heaven in a can?!? This ice cream cake recipe starts with a 9″x5″ loaf pan that’s been lined with a piece of plastic wrap that’s long enough to hang over the edges. Don’t skip this step, because this is what will allow you to easily lift the entire cake out of the pan once it’s frozen solid. Let your ice cream set out until it’s nice and soft. Then spread a layer that’s about 1/2-inch thick evenly across the bottom of the pan, making sure to push and smush it into all of the corners. 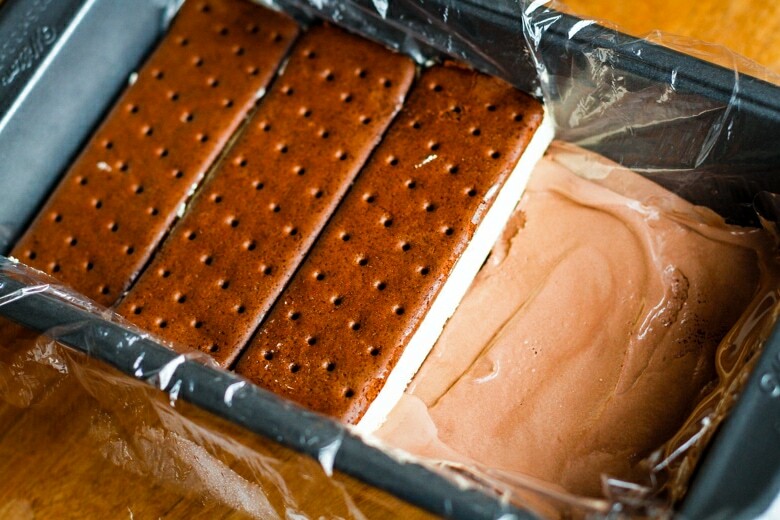 Next, line up 5 ice cream sandwiches on top of the ice cream layer. They will be a bit of a tight fit, but just keep pressing down firmly and they’ll conform to the pan. On top of the ice cream sandwiches, I spread about half a jar of hot fudge topping, and topped that off with a layer of crushed Oreo cookies. Make sure to reserve about 1/4 cup of the crushed cookies to sprinkle on top later! P.S. If you have the time and inclination, I can’t recommend this 5-minute, 5-ingredient hot fudge sauce recipe enough. 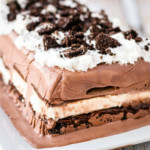 One batch will provide more than enough for this ice cream sandwich cake, along with leftovers for later sundaes. Finally, I added another layer of the chocolate ice cream and folded the plastic wrap over the top. Into the freezer it went for about four hours to freeze solid throughout. How simple is that?!? After freezing, I lifted the ice cream cake from the pan using the plastic wrap and transferred it to a serving platter. Then I topped it off with the Reddi-wip and a sprinkling of the reserved crushed Oreo cookies. You could also warm up some more hot fudge sauce to drizzle over the top — yum! PIN IT NOW! CLICK HERE TO ADD THIS ICE CREAM CAKE RECIPE TO YOUR EASY DESSERT RECIPES BOARD ON PINTEREST! Line a 9×5 loaf pan with plastic wrap, leaving a good amount hanging over each long side. Let your ice cream set out until it’s really soft. Spread a layer that’s about 1/2-inch thick evenly across the bottom of the pan, making sure to push it into all of the corners. Line up 5 ice cream sandwiches on top of the ice cream layer. They will be a bit of a tight fit, but just press down firmly and they’ll conform to the pan. 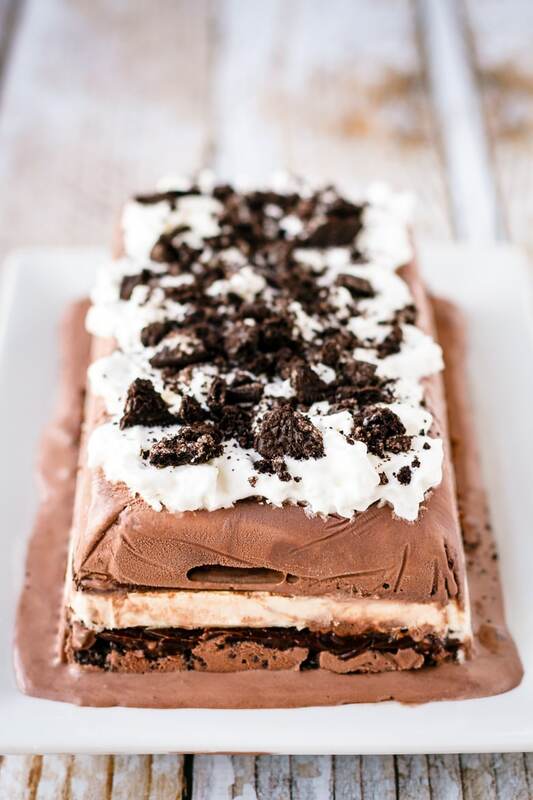 Spread about half a jar of hot fudge topping (or homemade hot fudge sauce) on top of the ice cream bars, and then sprinkle on a layer of crushed Oreo cookies. Make sure to reserve about 1/4 cup of the crushed cookies. 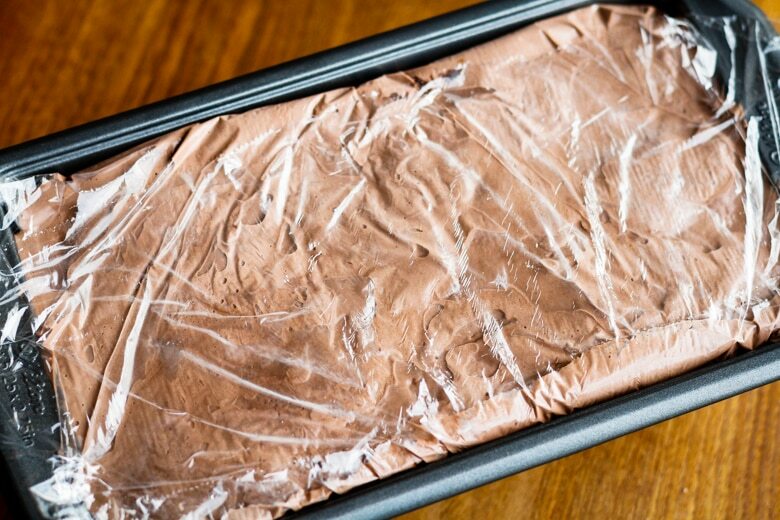 Add the final layer of chocolate ice cream and fold the plastic wrap over the top. Place in the freezer for about four hours to freeze through. 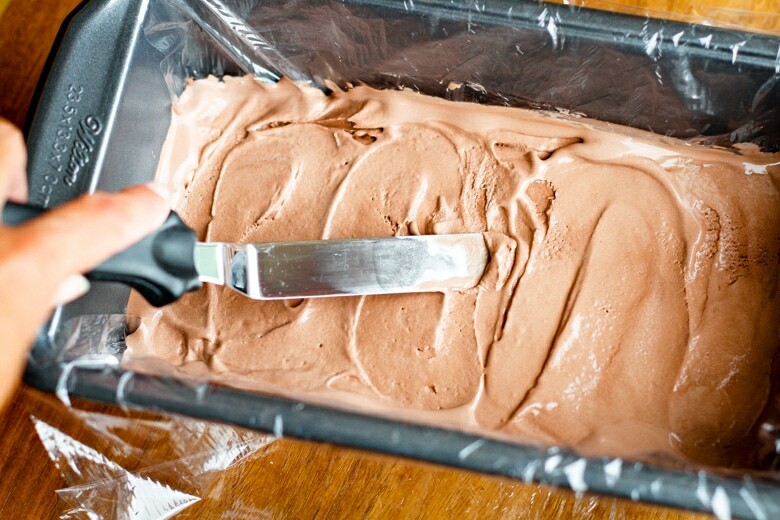 After freezing, lift the entire ice cream cake out of the pan using the plastic wrap and transfer it to a serving platter. Top it off with Reddi-wip or homemade whipped cream and a sprinkling of crushed Oreo cookies. To serve, slice with a knife that’s been dipped in warm water. Because you’re only using about half of each of the ingredients to make one cake, you could easily stretch your purchase to make TWO ice cream cakes. Just be sure to divide the ice cream evenly between two loaf pans. That makes this a fun and frugal dessert — perfect for last-minute summer cookouts! Looking for something a little more festive? Try this Funfetti Stars & Stripes patriotic ice cream cake… Filled with layers of Funfetti cake, chopped Snickers candy bars, hot fudge, and vanilla ice cream, the red, white and blue sprinkles make it the perfect finish to any Memorial Day, Fourth of July, or Labor Day gathering! I made this recipe, actually I made two, for our camping trip. I made them in the loaf pan and frozen them at home and then lifted them out of the pans by the saran wrap and put them into my camper freezer. No pans to wash!! When it was my turn to cook dinner and I pulled out the ice cream cake for dessert everyone cheered. It was delicious! On my second day of cooking dinner and it was time for dessert and I said I had another ice cream cake to serve all the kids were jumping around and yelling!! You really can stretch this to 12 servings very easily. I had some left over for both days and I refroze it and it was just as good as when we served it the first time. You will want to try this recipe, it is easy and delicious. 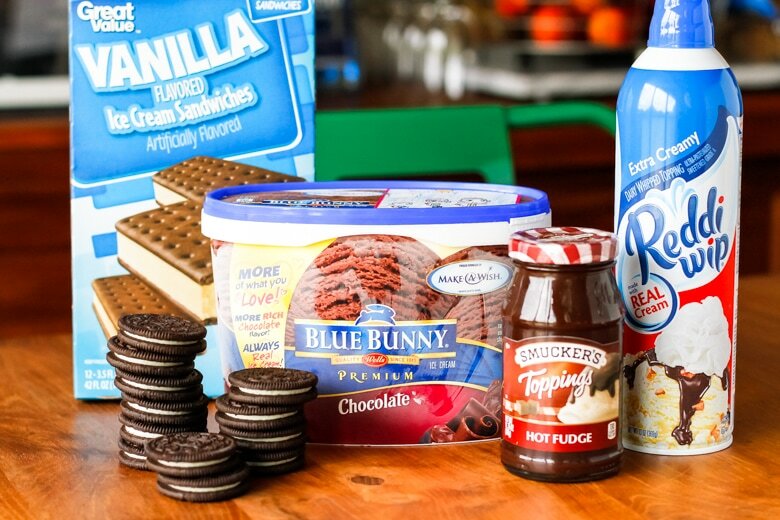 You also could use other ice cream flavors just as easily. I am wondering if I could make this in an 8 1/2 by 11 cake pan by doubling the recipe. Tara, would the recipe be too high for a regular cake pan? I’m pretty sure you could make it work by just spreading the softened ice cream a little thinner! The “recipe” is pretty flexible. We are going camping at the end of June. I am in charge of feeding three families on two nights. This has me a little nervous because I have never camped this way and I am not sure what to make. 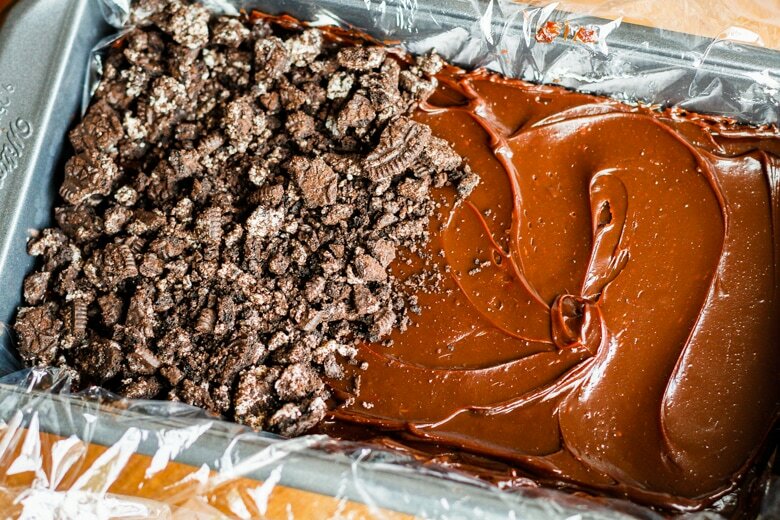 This ice cream cake will be perfect and it is going to be ready and waiting in my freezer. This sounds like a great recipe and I can’t wait to try it. Thank you, Tara!! Sounds like fun! Check out these foil packet recipes — they’re perfect for camping and feeding a crowd. If you don’t eat it all when it is first served, do you refreeze it or just toss it? Hey Meredith! I just refreeze it — no sense in wasting perfectly good ice cream cake, lol. It won’t be quite as pretty once it starts to melt, but it still tastes just as good! I actually followed this recipe for a family dinner where I needed to make a dessert, and it worked wonderfully! I highly recommend it for anyone in need of a quick and easy to make dessert! Thanks for sharing, Mia — so happy you loved it!